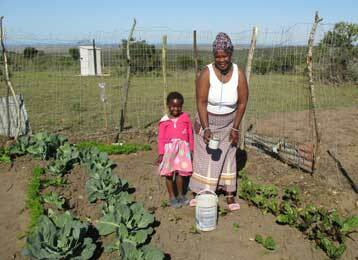 Veliswa Hlekani took up gardening for her family. She was diagnosed with HIV in 2009, but it wasn’t until 2015 that she was sick enough to need antiretroviral (ARV) treatment. At that point, Sweetness, the community health worker in her village supported by PWRDF’s partner the Keiskamma Trust, with funding from Global Affairs Canada, began to visit Vliswa even more regularly to help her to take her medicine properly, ensure she’s eaten well, and encourage her to be strong. Sweetness is one of 74 community health workers supported by Keiskamma Trust in 47 villages in the Eastern Cape of South Africa. They are the front line of health care and support for hundreds of families like Veliswa’s. Once Veliswa began her ARV regimen, Sweetness made sure she received a food package from Keiskamma Trust. Without enough good, healthy food to eat, ARVs can be fatal for the weakened system of an AIDS patient. But with food, the medications work wonders. Soon Veliswa was well enough to begin to support her daughter and two sons again. Through Keiskamma Trust, she learned to grow a rich variety of vegetables including spinach, carrot, beetroot, cabbage and onion. In April of 2016, she planted her first crop, and is using her harvest to feed the family. She is looking forward to having even more seeds to grow more vegetables and expand her garden in the future.